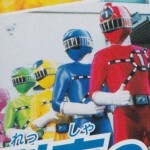 Ressha Sentai ToQger Ranger Key Set Rainbow Edition Revealed! After an intial tease with it’s latest Ranger Key Legend Set announcement, Premium Bandai has officially unveiled the anticipated Ressha Sentai ToQger Ranger Key Set Rainbow Edition! And boy do they mean it when they say rainbow. This massive set contains a whopping 40 individual Ranger Keys! These keys make up the totality of every single version of the 7 ToQgers that ever appeared on screen, even the recent addition ToQ-7! Every Line Change, even 0‘s & -100, all 5 Galaxy Line SOS Movie ToQgers, Dark ToQ-1, & even Rainbow ToQ-1 are ALL represented in this set! A special Ranger Key sound box with new voice clips recorded by Kappei Yamaguchi is also included to use these keys. Now here’s the bad news, this massive and amazing set carries a heavy price tag, 29,999 yen. Is this something you’d be interested in? The ultimate set for the ultimate completionist? Let us know in the comments below! And if you want one of the Rainbow Edition ToQger Ranger Key sets we suggest you get with your middleman ASAP! Ressha Sentai ToQGer Returns- Full Trailer Now Online! 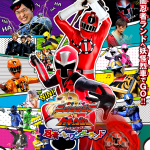 A new-full length trailer for the upcoming V-cinema project Ressha Sentai ToQGer: The Dreamed ToQ 7! has been uploaded online. Set 10 years after the conclusion of the series, the ToQGers must deal with the return of the Shadow Line and a mysterious new ally! Be Warned: video contains spoilers! This new Rainbow Line adventure will be released on Blu-Ray and DVD on June 24, 2015! Talkin Toku Podcast Episode 023 Released! It’s time for another episode of the official podcast of TokuNation.com – the Talkin Toku Podcast! Join your hosts Kickback/Chris, Den-O/Jordan, and Sentai Tamashii/Tom as they take an in-depth look at last summer’s toku movies – the summer movies of Ressha Sentai ToQGer and Kamen Rider Gaim! Did they like either movie? Did they dislike either movie? The answers you hear may surprise you – even more on who feels what way! They also talk a little Shuriken Sentai Ninninger at the start of the show and their feelings on the upcoming toy releases. Just like with ToQGer, at least one host isn’t on board with the dump truck dog UFO ninjas – and this time it isn’t Kickback! Who it is will shock you! Finally – we read YOUR comments from Twitter! And stay tuned for a very special episode of the Talkin Toku Podcast to be released later this week as the hosts and two special guests join in on a nothing-but-Power Rangers conversation discussing all of our thoughts and feelings on the premiere of Power Rangers Dino Charge! Until then – check out this episode and relive last summer all over again! Subscribe to all of the ways you can listen to us below! Toei’s official Youtube channel has put up a brief video announcement of a new V-Cinema project featuring Ressha Sentai ToQGer! Sadly, no plot details are available at the time of writing. All we can say for sure is that the Rainbow Line will return to action on June 24 2015! Stay tuned to TokuNation as we keep you up to date on this exciting new adventure! 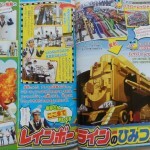 ToQGer Magazine Scans Reveal Hyper Ressha Tei-Oh! A new round of magazine scans are now online! At last we get to see the headquarters of the Rainbow Line! The massive Hyper Ressha serves as a rest station (called the Hyper Terminal) for the other Resshas and is also the home of the Rainbow Line President, who wears a costume similar to Conductor & Ticket- except with a gigantic bunny head. The President’s story is not yet revealed in full. Hyper Ressha transforms into a super-powerful Mecha form, Hyper Ressha TeiOh! This massive Ressha towers over the other combos & has a powerful arsenal strong enough to take on any Shadow creature. 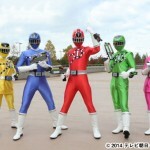 What other new adventures could be coming down the line for ToQGer? Stay tuned to TokuNation as we keep you up to date on the Rainbow Line! Toei’s YouTube Channel has released a trailer for a Special Talk Party segment featuring nine cast members from Kamen Rider Gaim and Ressha Sentai ToQger. This one hour special will be included on the upcoming Ressha Sentai ToQger Vs. Kamen Rider Gaim Vacation Combination Special DVD and Blu-ray releases. The DVD and Blu-ray will go on sale August 8th. Thanks to The Tokusatsu Network for reporting this news! Read the original story here. DX/Chogokin ToQ Oh (with new elbow joint adapters as well). 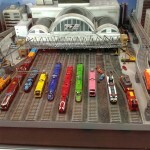 Also seen are a couple of amazing scaled display environments including a rail way station with the DX Resshas interacting. Gaim Arms Change Kiwami Arms, Knuckle, Sigurd & marika, Kamuro & Mar. As well as a GORGEOUS custom made for the show environment featuring various AC riders fighting in a Yggdrasil facility as well as in the forest of Helheim. Also an entire line up of the already released toylines for both Gaim & ToQger are on display. Including all the various DX Resshas and DX Lock Seeds ever released! And last but not least is the reveal of the ENTIRE Ultraman Ginga S toyline! Famously this line will feature a new gimmick very similar to Arms Change, only in a very literal sense. 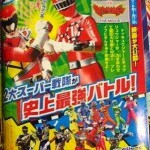 The new character Ultraman Victory will be able to scan Kaiju Spark Dolls to use their arms in battle! Be sure to check out over 50 images of the various displays Bandai has at the show, and stay tuned to TokuNation for further updates!